Billy Wizz Transport provides a reliable and professional transport service specialising in motorcycle transport, recovery, delivery or collection as well as courier services, light haulage and house removals. Priding ourselves on a professional and reliable service, we work with private customers and businesses alike providing transport for home removals, business and office removals, courier services and light haulage. Pallets or parcels, furniture or motorbikes, full or part load is no problem. We have recovered, delivered, collected and transported hundreds of motorcycle’s providing a professional and experienced service when you need to move a motorcycle for whatever reason in the UK or Europe. Full or part load we will help you transport just about anything that fits and is not hazardous. Located in Mid Sussex with many years experience we can help transport motorbikes and quad bikes among other things safely and securely with our clean and well maintained van fully equipped with spill kit and fire extinguishers. We are fully insured and will travel anywhere in the UK or Europe. Moving motorbikes for collection or delivery is one of our expertise and we pride ourselves on our know how when it comes to transporting motorbikes across the UK or Europe. "Punctual and professional and knows his stuff"
Big thanks to Joel for safely transporting my GSXR400 and VFR800 to the workshop for their service. He was punctual and professional and knows his stuff, I felt confident that the bikes were in good hands. Would definitely use BillyWizz again and highly recommend! "Very efficient, reliable & were able to accommodate us at short notice"
Thakeham Homes were very impressed with Billywizz's showhome removal service, the team were very efficient, reliable and were able to accommodate us at quite short notice. We will have no hesitation in using them again in the future for any of our showhome removals. "I strongly recommend them and will certainly use them again"
Joel transported two motorcycles for me. He has the correct equipment to secure the motorcycles safely. This was the second time I have used Billywizz transport.I strongly recommend them and will certainly use them again. "Very happy with the service & have already booked to collect another bike"
I used Billywizztransport to collect a yamaha xs 1100 from Manchester. I was let down at the last minute by another company, so I contacted Joel at Billywizztransport who said he would do it the very next day. I was very happy with the service and have already booked him to collect another bike for me. "Reliable, punctual and above all safe transportation service"
I can highly recommend BillyWizzTransport for a reliable, punctual and above all safe transportation service. My bike was recently booked in for a photo shoot for Fast Bikes magazine in Bath but unfortunately I was let down by my transport provider. BillyWizz stepped in at the last minute to save the day and transport my prized possession. He takes great care loading/unloading and has secure and safe transportation methods and is reasonably priced too. Many thanks. "I would highly recommended Billy Wizz Transport"
We have used Billy Wizz Transport for over 2 years with no complaints even from my more discerning customers, Where punctuality, courtesy and reliability are important. I Would highly recommended them. "I wouldn't hesitate in recommending him for any transport requirement"
I use Billy Wizz Transport for delivering medium to large items of furniture to my customers, these items need to arrive in perfect condition and I trust Joel to carry this out without hitch. I wouldn't hesitate in recommending him for any transport requirement. I have used Billy Wizz to recover my Ducati Monster and cannot praise the prompt service and care that he took with my prized possession enough. A total professional and really nice guy. Nice clean van too! "Extremely reliable, extremely professional and I have yet to see a van that is cleaner!" Billy Wizz Transport is an integral part of our ablity to be able to pick up customer's bikes in a very professional and safe environment with utmost attention towards the customers bike. BillyWizz also caters for our race bikes, taking care of all our race transport. Extremely reliable, extremely professional and I have yet to see a van that is cleaner! Highly recommended. "Billy Wizz transport has always gone the extra mile"
Billy Wizz Transport have been a valued partner of Seawhite of Brighton Ltd for the last 4 years. Delivering to our demanding customer base of schools, colleges, universities and shops Billy Wizz transport has always gone the extra mile to meet both our and our customer's expectations. "Clean, fully kitted vehicle portrays professionalism"
We at Bikes of Brighton have known Joel for a number of years and have used his company Billy Wizz Transport on numerous occasions for the transport of motorcycles. He is reliably efficient and his clean, fully kitted vehicle portrays his professionalism. We are proud of the reputation our company has built up over 35 years and we have no hesitation in recommending Joel's services." "Flexible, reliable and well equiped for motorcycle transport"
Sussex Car Storage is a discerning company caring for its valued customers' cars and motorcycles. As such we will only employ transport services providing the highest professional standards. Billy Wizz transport is flexible, reliable and well equiped for motorcycle transport. His polite demeanour and punctuality make him our preferred choice. "highly recommend this friendly and professional service"
Billy Wizz provide a very professional and reliable service. I use my bike every day and after breaking down needed to get it looked at urgently. Billy Wizz fitted me in at very short notice and transported my bike safely, quickly and efficiently to my local dealership. I would highly recommend this friendly and professional service. 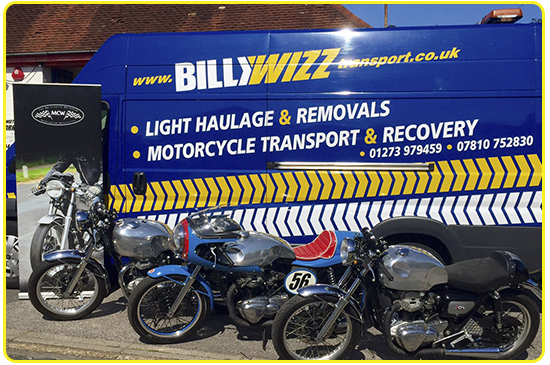 "Highly reliable, punctual and took great care of the bikes"
I Used Billy Wizz Transport to take two Triumph Thruxton’s from West Sussex to Darley Moor Racing Circuit for a track day/race licensing. The bikes were picked up the night before and arrived in perfect condition and ahead of time for our track sessions. The bikes were packed up and transported back to West Sussex the same evening. I would definitely recommend Billy Wizz - highly reliable, punctual and took great care of the bikes. I used BillyWizz Transport to take my BMW K1200LT motorcycle from my home address in West Sussex to an independent BMW specialist in Tonbridge. Joel responded to my query with efficiency and fitted my request in within two days, other transporters had quoted a lead time of three weeks. The van was immaculate and Joel took great care in loading and securing my large touring motorcycle. He even sent a text confirming that my motorcycle had reached its destination. I would recommend BillyWizz Transport to anybody who has a need to have their motorcycle recovered, a very professional service. Very many thanks for your superb service today. You did what you said and collected the quad bike from the Sussex owner exactly on time and then brought it here to Kings Langley after a two hour journey. Not only that, but you paid the balance of the money owing to the owner on our behalf. You also gave the machine a “once over” before you loaded it into your vehicle for delivery. You called us when you were on your way giving us an ETA of 12.45 pm and that was the time you arrived. Excellent service all round and very many thanks. "Restores your faith in professionalism and unmatched customer service"
Following a low side crash of my beloved VFR750 my bike was initially recovered into storage through my insurance. Having taken the decision not to claim however, I needed to have the bike transported to my home. Recovery firm quoted a fortune to do this (I think they hoped I would abandon it) so I called Joel. Every so often you come across small businesses that restore your faith in professionalism and unmatched customer service. Billy Wizz is one of these! While I was in surgery to have my wrist repaired, Joel expertly retrieved my bike and delivered it safely to my home. Since I was in a fresh cast, Joel even took the time to maneuver it into my back garden and get it onto the centre stand for me. Crash recovery can be a traumatic experience and while I hope not to need Billy Wizz for this again they will be my first call should the need arise. I can't thank them enough! "No hesitation in recommending his services"
We first used Billy Wizz Transport in October of this year, because they came so highly recommended in the motorcycle industry. I can honestly say how true this is and a credit to the trade too! We at Fly And Ride now use Billywizz Transport for all our UK work and have no hesitation in recommending his services. 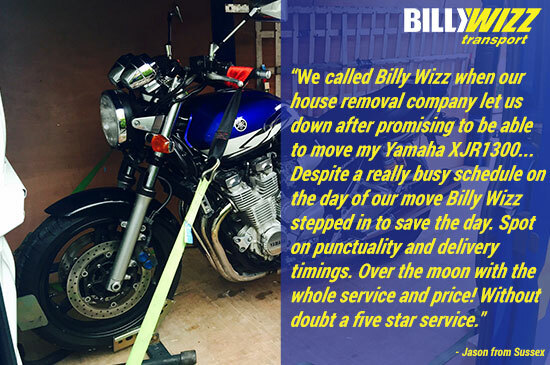 "Without doubt a five star service"
My wife called Billy Wizz when our house removal company let us down after promising to be able to move my Yamaha XJR1300, from Crawley, West Sussex to Pevensey, East Sussex. Despite a really busy schedule on the day of our move Billy Wizz stepped in to save the day. Spot on punctuality and delivery timings. Over the moon with the whole service and price! Without doubt a five star service. I contacted Joel when the company I was working for closed down and I needed to move my tools out of the hangar at Redhill. Joel was very helpful and was able to organise the move at a time that suited me. My toolbox arrived at its destination safe and sound. Excellent service and I wouldn't hesitate to use Joel's services in the future. Billy Wizz Transport provides a professional transport service with many years of experience with hauling just about anything we can fit in our vans. Specialising in motorcycle collection and delivery, man and van courier service, home removals, light haulage, quad bikes and more. Located in Sussex, covering Brighton and Hove, Hayward’s Heath, Burgess Hill, Worthing, Hassocks, Crawley and surrounding areas.